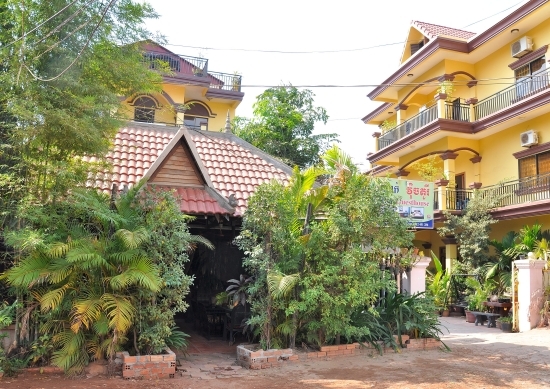 Finding budget accommodation in Siem Reap that might make you want to stay in with a good book rather than go out visiting the awesome temples of Angkor is a bit of a tall order. But the friendly staff, spacious rooms from just $10, and the convivial atmosphere of its communal lounge and restaurant all conspire to make the Victory Guesthouse a serious contender. Average rating 7.7 from 89 reviews. So homely, you might not want to go out. The Victory’s 40 rooms are housed in two modern ochre-painted buildings on opposite sides of a quiet road between Route 6 – the Airport Road – and Sivatha Boulevard, Siem Reap’s main shopping Street. It’s a short walk to the start, if not the heart, of Siem Reap’s action, and there are always tuk tuks on hand if you don’t fancy the 15-minute walk to Pub Street and the Old Market area. Entrance to the Victory’s newer building. If you prefer getting around on two wheels, the guesthouse can arrange bike rental for you, and they also offer secure storage and 24-hour security if you do hire them elsewhere during your stay. For those who seriously don’t want to go too far afield, and like nothing better than to kick back and chill out once your sightseeing duties are done, then despite the quiet location, you could feasibly stay here for three nights, just lounging on the spacious balconies and roof terraces, and dine somewhere different each night without even leaving the Victory’s own street. A good spot for a natter… and a G & T.
The guesthouse has its own restaurant which is open 06:00 to 22.00, serving soups and snacks from $1.50, rice and noodle dishes from $3.00 and Western mains from $4.00. There are also cold drinks for sale – including local Angkor beer for $1 a can — and there’s a communal fridge, which is handy if they don’t sell what you like and you’ve managed to track down your own tipple in one of the town’s supermarkets. Top tip – you can get a litre of gin for less than $10 at the nearby Angkor Market. 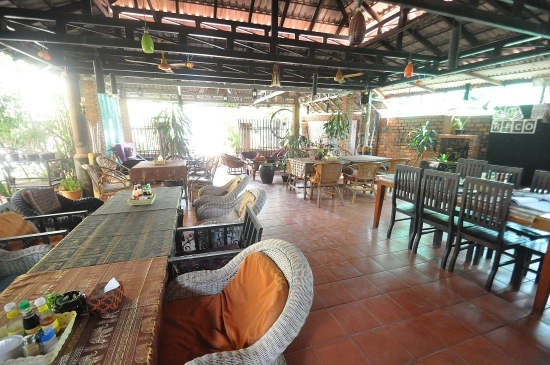 Less than 50 yards away is the lovely Mother Home Inn with its bar, terrace and restaurant (and pool if you are prepared to pay for the privilege), and in between The Victory and Mother Home is a handy – although as yet untested –street food stall, nestling in the shade of a pretty traditional wooden Khmer house. You enter the Victory through the large restaurant and lounge area, surrounded by lush tropical plants and orchids, and beyond this is the reception, decorated with fresh-cut flowers and an eclectic collection of photographs, paintings and drawings. You could easily while away an hour or two here. The airy pastel-painted rooms are spread over three floors in each building and range from large single rooms – with double bed – from $10 a night (fan only) to triple-bedded rooms with air-con for $18 a night. All rooms have cable TV, free WiFi, and ensuite shower rooms with hot water. In the newer building, we did see some rooms without external windows, so ask to see rooms first if you want to avoid these. Long-stay guests can also enjoy the luxury of a fridge in the room – subject to availability. $20 for a triple ensuite with air con: Clean, bright and… er, cheap. Room rates include breakfast from an extensive menu including eggs, fresh fruit and pancakes, free airport or bus station pickup, daily drinking water and a free Siem Reap guide book. Daily room cleaning is available — you just have to leave your key at reception when you go out if your room needs freshening up. There is a tour desk, in-house laundry services – which means less risk of items going missing — and a safety deposit box. The Victory is a very popular choice in the budget range so is a great place to meet people, not only fellow travellers but also volunteers and charity workers, as the guesthouse provides accommodation for two local NGOs. Booking ahead is always a good idea and in high season it’s essential. 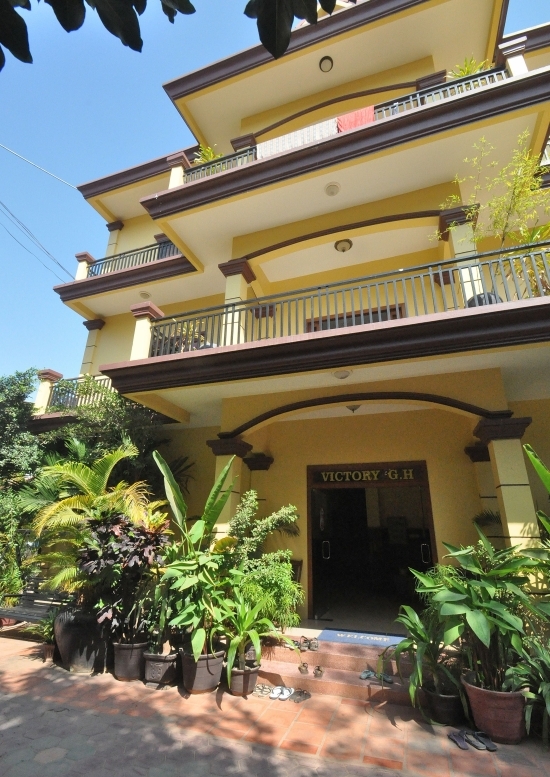 While it may not quite make you want to give the temples a miss completely, Victory Guesthouse is a great value place that you’ll certainly be happy to go back to after a day of hot and dusty temple-touring. 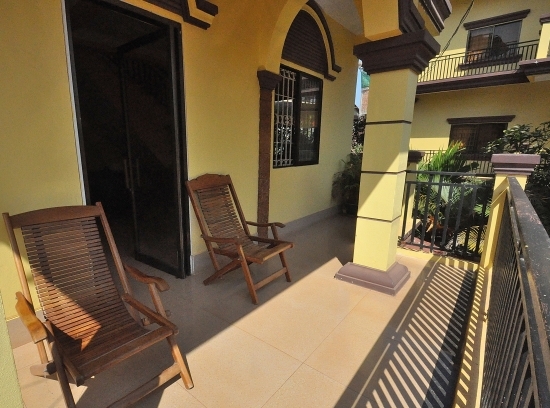 Check rates at The Victory Guesthouse on Booking.com.